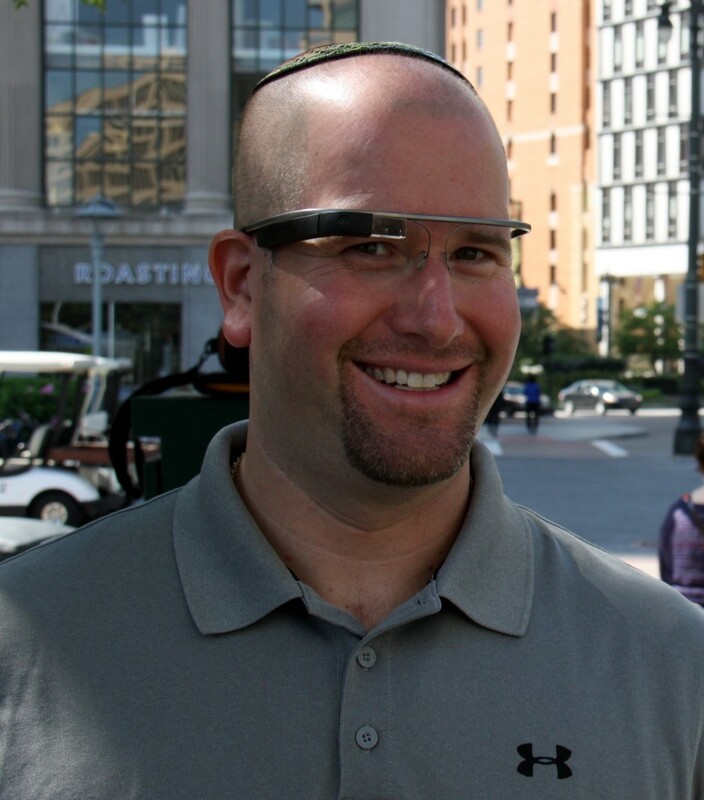 Home › Jewish Techs Blog › Looking for a Luach Mobile App? 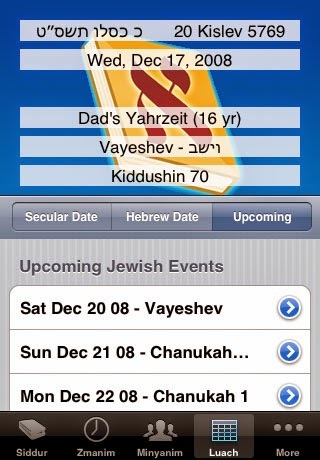 Put a Hebrew Calendar on Your iPhone! The joke struck a chord for so many Jews because we all know we don’t use the Jewish year or the Jewish calendar very much in our everyday lives. Even most Israelis write the secular year on their checks and on contracts and celebrate the Gregorian date for birthdays and anniversaries. The Jewish calendar, however, does play a significant role our lives. We need to know when to observe our departed relatives’ yahrzeits dates. We need to schedule our events and travel plans around the Jewish holidays. We need to schedule our children’s bar and bat mitzvahs according to their Jewish birthdays. The rhythm of the Jewish calendar affects us emotionally. The Jewish calendar, known in Hebrew as luach Hashanah, takes us on a journey. The calendar is made up of days in which we celebrate and days in which we grieve. Some Jews, especially those working in a professional capacity in the Jewish community, have historically carried a small pocket luach to know the Jewish holidays and the Jewish dates. In the past two decades these print Hebrew calendars have morphed into digital calendars and mobile apps. I started using an electronic version of the luach back in 1997 when I got my first Palm Pilot, which was one of the first personal data assistants (PDA) on the market. While there were several luach apps available to install onto the Palm Pilot, the most advanced of the lot was a company named Penticon Technologies’s version. The app was simply called “Luach” and it integrated flawlessly with the native calendar on the device. What was so great about Luach was that in addition to converting any date on the Gregorian calendar to the Jewish date, the app also kept a record of special events such as relatives’ yahrzeits dates and it then synced those dates with the device calendar. So rather than depend on the postcard reminders from funeral homes and synagogues about an upcoming yahrzeits observance, one could simply set an alarm reminder on the PDA. As a new rabbinical student at the Jewish Theological Seminary in the late 1990’s I found myself being the go to techie for my fellow students who wanted the mobile luach installed on their pocket data organizer. Penticon’s Luach quickly became the killer app for anyone in the Jewish professional world. The dean of the rabbinical school at the time, Rabbi William Lebeau, told the senior class that they could not be ordained as a rabbi from the Seminary unless they had a PDA with Luach installed. Fast forward more than fifteen years and those Palm PDAs now seem archaic by today’s technology. Just about everyone now carries a smartphone in their pocket with a fast Internet connection. Determining a Hebrew date or ascertaining when a Jewish holiday will occur several years from now is as simple as a Google search. However, those who prefer to have a luach app at the ready on their phone have a plethora of good apps to choose from. For Apple devices running iOS, Tebeka Software Solutions’ Pocket Luach is one of the most popular apps. For smartphones and tablets running the Android operating system, Simple Luach and AvivoNet’s Luach Hebrew Calendar are popular and work pretty well. RustyBrick, one of the most successful developers of Jewish mobile apps released a luach app that is a siddur (prayer book) as well as a Jewish calendar with what are known as z’manim, or specific times for Jewish prayer throughout the day including Shabbat and Holiday candle lighting and Havdallah times. Reconnected with Howie Hirsch of Penticon in December 2012 in Jerusalem. It had been many years since he worked on his company’s Luach app because Palm Pilots were out of production and everyone had shifted to either Apple, Android or Windows mobile phones. He told me he was working on an Apple iOS version of Luach and asked if I’d be willing to join his team of beta testers. I told him I’d be happy to. There is a new beta version of Luach available for downloading. Hopefully this will be the last beta version. We are now in the process of submitting Luach to the App store, and making it available to the general public. Hopefully the official release will be within the next few weeks. In mid-April Howie sent out a beta version of Luach for iOS that has the final fine tuning in order to be ready for an official release, which means it could be available before the High Holidays this year. Like the original versions of Luach, the iOS version will let users enter special events like yahrzeits dates, anniversaries, birthdays and bar/bat mitzvahs. It will also allow users to customize the Shabbat and holiday times based on their location and communal customs (i.e., how long to wait until making Havdallah). It’s great to see Howie back in action with Penticon’s Luach and I think it will quickly become the most downloaded luach app in the Apple AppStore when it’s finally released. All of the luach apps on the market are designed for traditional Jews, meaning Orthodox and Conservative Jews who, in the Diaspora, observe an extra day of major holidays. Reform Jews, who do not observe the extra day of holidays in the Diaspora, have struggled to find a luach app that allows for customization they desire. However, Rabbi Leon Morris is hoping to change that with the Reform Luach app he is currently developing. Rabbi Morris, who is making Aliyah with this family, and I began discussing his idea for a Reform version of a luach app in early 2013 and he had made great strides in bringing it to the fruition. “Jewish professionals have long relied on the luach in planning community programming and observances,” Morris explained. “Reform Jewish professionals had no calendar resource geared specifically toward us; our only option was to consult a luach from another denomination and then rework each day’s observance based on Reform custom and liturgy. Reform Luach is intended to assist Reform rabbis, cantors, and prayer leaders in planning worship and synagogue observances.” Reform Luach is now in beta version and drawing its data primarily from the HebCal.com website. We might not think about the Jewish calendar on a daily basis, but it has an impact on our Jewish lives. Figuring out holidays, yahrzeits and minyan prayer times once took quite the effort, but today we have quick and accurate access to that information on our desktop computers and on the mobile phones we keep with us at all times. From luach mobile apps to integrated Jewish desktop calendars, the Jewish people is more in touch with the calendar of our heritage than ever before.